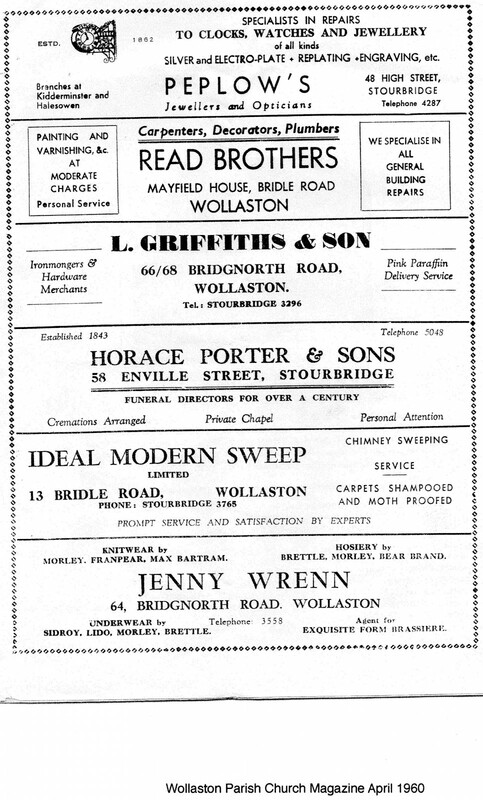 A copy of the Parish Magazine for April 1960 carried 24 advertisements for local shops and businesses in Wollaston and Stourbridge. The six shown here include two, an undertakers and the jewellers, which were in Stourbridge. Peplow’s is still in the same shop in Stourbridge High Street. The others include a chimney sweep who would have had plenty of work in the days when many houses still had open fires and it is interesting to note that he also offered carpet shampooing. The two shops in Bridgnorth Road were next door to each other. Horace Porter & Sons in Enville Street - eeek! Used to get the bus from Wollaston and got off in Enville Street to attend Beauty Bank School and had to walk past this Funeral Directors every morning. Can still picture the man who used to stand in the front of the shop in his black suit, I would run to school past him.